As early as the 1950s electronic elements started to appear in passenger vehicles. Over the years the electronic content and complexity continued to grow in vehicles. In 1983, it was formally stated at Robert Bosch AG that a real-time communication link was required between three electronic control units: engine control, automatic transmission control and the anti-skid braking system. Despite the existence of a number of proprietary automotive multiplexing protocols, a new serial communications protocol emerged from Bosch's endeavor, the Controller Area Network (CAN). In mid 1987 the first working silicon for CAN became available. In 1993 CAN was standardized by the International Standardization Organization (ISO). In time-triggered CAN the exchange of messages is controlled essentially by the temporal progression of time. The exchange of a specific message may only occur at a predefined point 'in relative' time during time-triggered operation of the protocol. This 'benchmark' in time, to which all other communication transactions are related, is defined by the start of frame (SOF) bit of a specific message known as the reference message. The reference message is transmitted either periodically (in time triggered mode) or on the occurrence of a specific external event (in event triggered mode).The reference message is recognized by all nodes participating in the TTCAN network by virtue of its CAN frame identifier. Each node synchronizes to the reference message, which provides a reference point in the temporal domain for the static schedule of the message transactions. The static schedule sequence is based on a time division access (TDA) scheme whereby message exchanges may only occur during specific time slots or time windows. When the nodes are synchronized, any message can be transmitted at a specific time slot, without competing with other messages for the bus. Thus the loss of arbitration is avoided, the latency time becomes predictable. The TTCAN protocol is in the process of standardization by ISO TC22/SC3/ WG1/TF6 describes TTCAN on system level. This paper describes the implementation of TTCAN features into a CAN module and the evaluation of a TTCAN network. CAN is the dominating network for automotive applications. New concepts in automotive control systems require a time triggered communication. This is provided by TTCAN, ISO 11898-4 . The main features of TTCAN are the synchronization of the communication schedules of all CAN nodes in a network, the possibility to synchronize the communication schedule to an external time base, and the global system time. TTCAN nodes are fully compatible with CAN nodes, both in the data link layer (ISO 11898-1) and in the physical layer; they use the same bus line and bus transceivers. Dedicated bus guardians are not needed in TTCAN nodes, bus conflicts between nodes are prevented by CAN’s non-destructive bitwise arbitration mechanism and by CAN’s fault confinement (error-passive, bus-off). Existing CAN controllers can receive every message in a TTCAN network, TTCAN controllers can operate in existing CAN networks. A gradual migration from CAN to TTCAN is possible. The minimum additional hardware that is required to enhance an existing CAN controller to time triggered operation is a local time base and a mechanism to capture the time base, the capturing triggered by bus traffic. Based on this hardware, which is already existent in some CAN controllers, it is possible to implement in software a TTCAN controller capable of TTCAN level 1. A TTCAN controller capable of TTCAN level 2, providing the full range of TTCAN features like global time, time mark interrupts, and time base synchronization, has to be implemented in silicon. A TTCAN controller can be seen as an existing CAN controller (e.g. Bosch’s C_CAN module) enhanced with a Frame Synchronization Entity FSE and with a trigger memory containing the node’s view of the system matrix. The TTCAN test chip (TTCAN_TC) is a standalone TTCAN controller and has been produced as a solution to the hen/egg problem of hardware availability versus tool support and research. The TTCAN_TC supports both TTCAN level 1 and TTCAN level 2; its time triggered communication is not depending on software control. Many vehicles already have a large number of electronic control systems. The growth of automotive electronics is the result partly of the customer’s wish for better safety and greater comfort and partly of the government’s requirements for improved emission control and reduced fuel consumption. Control devices that meet these requirements have been in use for some time in the area of engine timing, gearbox and carburetor throttle control and in anti-block systems (ABS) and acceleration skid control (ASC).The complexity of the functions implemented in these systems necessitates an exchange of data between them. With conventional systems, data is exchanged by means of dedicated signal lines, but this is becoming increasingly difficult and expensive as control functions become ever more complex. In the case of complex control systems, the number of connections cannot be increased much further. 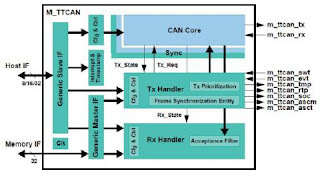 CAN, which is by now available from around 40 semiconductor manufacturers in hardware, provides two communication services: the sending of a message (data frame transmission) and the requesting of a message (remote transmission request, RTR). All other services such as error signaling, automatic re-transmission of erroneous frames are user-transparent, which means the CAN chip automatically performs these services. The equivalent of the CAN protocol in human communication are e.g. the Latin characters. This means a CAN controller is comparable to a printer or a type writer. CAN users still have to define the language/grammar and the words/vocabulary for communication. A multi-master hierarchy, which allows building intelligent and redundant systems. If one network node is defect the network is still able to operate. Broadcast communication. A sender of information transmits to all devices on the bus. All receiving devices read the message and then decide if it is relevant to them. This guarantees data integrity as all devices in the system use the same information. Sophisticated error detecting mechanisms and re-transmission of faulty messages. This also guarantees data integrity. The TTCAN (time-triggered communication on CAN) protocol is a higher layer protocol on top of the CAN (Controller Area Network) data link layer as specified in ISO 11898-1. It may use standardized CAN physical layers such as specified in ISO 11898-2 (high-speed transceiver) or in ISO 11898-3 (fault-tolerant low-speed transceiver). Time-triggered communication means that activities are triggered by the elapsing of time segments. In a time-triggered communication system all points of time of message transmission are defined during the development of a system. A time-triggered communication system is ideal for applications in which the data traffic is of a periodic nature. CAN is the dominating network for automotive applications. New concepts in automotive control systems require a time triggered communication. This is provided by TTCAN, ISO 11898-4. The main features of TTCAN are the synchronization of the communication schedules of all CAN nodes in a network, the possibility to synchronize the communication schedule to an external time base, and the global system time. TTCAN nodes are fully compatible with CAN nodes, both in the data link layer (ISO 11898-1 ) and in the physical layer; they use the same bus line and bus transceivers. Dedicated bus guardians are not needed in TTCAN nodes, bus conflicts between nodes are prevented by CAN’s nondestructive bitwise arbitration mechanism and by CAN’s fault confinement (error-passive, bus-off). Existing CAN controllers can receive every message in a TTCAN network, TTCAN controllers can operate in existing CAN networks. A gradual migration from CAN to TTCAN is possible. The minimum additional hardware that is required to enhance an existing CAN controller to time triggered operation is a local time base and a mechanism to capture the time base, the capturing triggered by bus traffic. Based on this hardware, which is already existent in some CAN controllers, it is possible to implement in software a TTCAN controller capable of TTCAN level 1. A TTCAN controller capable of TTCAN level 2, providing the full range of TTCAN features like global time, time mark interrupts, and time base synchronization, has to be implemented in silicon. A TTCAN controller can be seen as an existing CAN controller (e.g. Bosch’s C_CAN module) enhanced with a Frame Synchronization Entity FSE and with a trigger memory containing the node’s view of the system matrix (see Figure 1). The TTCAN test chip (TTCAN_TC) is a standalone TTCAN controller and has been produced as a solution to the hen/egg problem of hardware availability versus tool support and research. The TTCAN_TC supports both TTCAN level 1 and TTCAN level 2; its time triggered communication is not depending on software control. All synchronization mechanisms described in this paper are supported by the TTCAN_TC. The cyclic message transfer of TTCAN level 1 can be implemented in software, based on existing CAN modules. Depending on the CAN bit rate and on the number of messages in the system matrix, the software approach may result in a high CPU load. For the evaluation of the TTCAN protocol, the hardware approach was chosen. In parallel to the standardization process, Bosch develops an IP module that implements the TTCAN protocol. This IP module, the TT_CAN, is based on the existing C_CAN IP module and will be available as VHDL code to be synthesized in FPGAs, supporting the development of CAN based time triggered communication networks. The C_CAN consists of the components CAN Core, Message RAM, Message Handler, Control Registers, and Module Interface. The CAN_Core performs communication according to the CAN protocol version 2.0, as defined in ISO 11898-1. The bit rate can be programmed to values up to 1MBit/s depending on the used technology. For the connection to the physical layer additional transceiver hardware is required. For communication on a CAN network, individual Message Objects are configured. The Message Objects and Identifier Masks for acceptance filtering of received messages are stored in the Message RAM. All functions concerning the handling of messages are implemented in the Message Handler. Those functions are the acceptance filtering, the transfer of messages between the CAN Core and the Message RAM, and the handling of transmission requests as well as the control of the module interrupt. The register set of the C_CAN can be accessed directly by an external CPU via the module interface. These registers are used to control/configure the CAN Core and the Message Handler and to access the Message RAM. 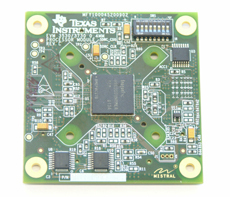 Several Module Interfaces are available, including interfaces to ARM, Motorola and Texas Instruments CPUs. Compared to the C_CAN, the TT_CAN is expanded by two functional blocks, the Trigger Memory and the Frame Synchronization Entity FSE. The Trigger Memory stores the time marks of the system matrix that are linked to the messages in the Message RAM; the data is provided to the Frame Synchronization Entity. Time Base Builder generates the local time from the node’s system clock and the time unit ratio. In TTCAN level 1, the TUR is defined at configuration, in level 2; it is continuously adapted by the GTU. The Cycle Time Controller gets the local time from the TBB, the Frame_Synchronisation events from the CAN_Core, and the reference messages from the Message Handler. It captures the Sync_Mark and the Ref_Mark to generate the cycle time and controls the sequence of the basic cycles in the matrix cycle. Cycle Count (part of the reference message) identifies the actual basic cycle inside the matrix cycle. Depending on whether the node itself is time master (transmitter of reference messages), Cycle Count is either generated from a cyclic counter or it is received in the reference message. The Time Schedule Organizer maintains the message schedule inside a basic cycle and checks for scheduling errors. The schedule is defined by data in the Trigger Memory. The data consists of time mark (measured in cycle time), and function (trigger for transmission or check of reception), and is linked to a message in the Message RAM. The same time mark may be, selected by Cycle Count, defined for different messages at different basic cycles of the matrix cycle. Other time marks are defined for the Ref Trigger and the Watch Trigger. The TSO compares the time marks with the cycle time and activates the Time Triggers for messages with matching time marks. The function of the TSO depends on the actual operating state; transmissions are disabled when the node is not synchronized to the system. If the node is time master, the Ref Trigger causes the reference message to be transmitted. The Watch Trigger becomes active at the end of a basic cycle, when the expected start of a new basic cycle (completion of a reference message) does not occur. This event is causes the MSA to change the operating state. The Master State Administrator controls the FSE’s operating state. The operating state depends on whether the node is synchronized to the network, whether it is (trying to become) time master or whether it is a backup time master. The synchronization state differentiates between synchronizing after the initialization, the active mode, the loss of synchronization, and the fault recovery. The Application Operation Monitor checks the function of the application program. The application controller has to serve the Application Alive input regularly. If the application program fails, the application watchdog causes the MSA to disable all transmissions, preventing invalid data to disturb the system. The Global Time Unit (TTCAN level 2 only) generates the node’s view of the global time and controls the drift correction of the local time. When the node is the first time master of the network, the node’s local time is the global time. When the node is not operating as time master, the difference between local Ref_Mark and Master_Ref_Mark received in the reference message is compared and defines the actual offset between the local time and the global time. The actual offset is updated at each start of a basic cycle; when the node becomes time master, the last offset is kept, avoiding a discontinuity in the global time. The Global_Ref_Mark (captured in global time) is provided as Master_Ref_Mark for reference messages to be transmitted. The GTU compensates the drift between the local time and the global time by calibrating the local time. If the node itself is the time master, no calibration is done. Each time a reference message is completed, the actual length of the base cycle is measured in local time (Ref_Mark - previous Ref_Mark) and in global time (Master_Ref_Mark – previous Master_Ref_Mark). The difference between the two measured values divided by the length of the base cycle shows the factor by which the local time has to be calibrated in order to compensate the drift. The compensation is performed by adapting the TUR the TBB uses to generate the local time from the node’s system clock. The calibration process is on hold when the node is not synchronized to the system and is (re-)started when it (re-)gains synchronization. Frequent significant changes in the measured drift indicate an unreliable local time base. Time base errors are signaled to the MSA, causing it to stop all TTCAN operations. In order to synchronize different TTCAN networks, or to provide a physical time base, the global time may be synchronized (via the time master) to an external clock, e.g. GPS. The TTCAN implementation is done in two steps. In the first step, only level 1 is implemented, without the global system time and drift compensation of level2. In the second step, after the evaluation of the TT_CAN IP module in a TTCAN network, a global time unit will be added to the module. Each node has its own time base, Local Time, which is a counter that is incremented each Network Time Unit NTU. The length of the NTU is defined by the TTCAN network configuration; it is the same for all nodes. It is generated locally, based on the local system clock period t-sys and the local Time Unit Ratio TUR. Different system clocks in the nodes require different (non-integer) TUR values. In TTCAN level 1, TUR is a constant and Local_Time is a 16 bit integer value, incremented once each NTU. The NTU is the CAN bit time. In TTCAN level 2, Local_Time consists of a 16 bit integer value extended by a fractional part of N (at least three) bit. Local_Time is incremented 2N times each NTU, providing a higher time resolution than in level 1. TUR is a non-integer value and may be adapted to compensate clock drift or to synchronize to an external time base. In the TTCAN network, the synchronization of the nodes is maintained by so-called Reference Messages that are transmitted periodically by a specific node, the time master. The Reference Message is a CAN data frame, characterized by its identifier. Valid Reference Messages are recognized synchronously (disregarding signal propagation time) by all nodes. Each valid Reference Message starts a new basic cycle and causes a reset of each node’s Cycle_Time. The value of Local_Time is captured as Sync_Mark at the start of frame (SOF) bit of each message. When a message is recognized as a valid Reference Message, this message’s Sync_Mark becomes the new Ref_Mark; Cycle_Time is the actual difference between Local_Time and Ref_Mark, restarting at the beginning of each basic cycle when Ref_Mark is reloaded. Even in a software implementation of TTCAN, the capturing of Local_Time into Sync_Mark at each SOF must be done in hardware (see Figure 1). ISO 11898-1 specifies the necessary hardware interface as an optional feature; it is already implemented in some CAN controllers. There are two levels of implementation in TTCAN, level 1 and level 2. In TTCAN level 1, the common time base is the Cycle_Time which is restarted at the beginning of each basic cycle and is based on each node’s Local_Time. In TTCAN level 2, there is additionally the Global_Time which is a continuous value for the whole network and is the reference for the calibration of all local time bases. The time master captures its view of Global_Time at each Sync_Mark and transmits that value in the Reference Message, as Master_Ref_Mark. For all nodes, Global_Time is the sum of their Local_Time and their Local_Offset, Local_Offset being the difference between their Ref_Mark in Local_Time and the Master_Ref_Mark in Global_Time, received (or transmitted) as part of the Reference Message. The Local_Offset of the current time is master zero if no other node has been the current time master since network initialization. The phase drift between Local_Time and Global_Time is compensated at each received Reference Message by updating Local_Offset. Changes in Local_Offset show differences in the local node’s TU and the actual time master’s NTU. The calibration process is on hold when the node is not synchronized to the system, it is (re-)started when it (re-)gains synchronization. The necessary accuracy of the calibration is defined by the system’s requirement; a plausibility check for the value of df ensures that the length of the NTU remains in a predefined range. This calibration, together with the higher resolution for the NTU, provides a high precision time base. After initialization, before synchronizing to the network, each node sees its own Local_Time as Global_Time, the Local_Offset is zero. The actual time master establishes its own Global_Time as the network’s Global_Time by transmitting its own Global_Sync_Marks in the Reference Message, as Master_Ref_Marks. When a backup time master becomes the actual time master, it keeps its Local_Offset value constant, avoiding a discontinuity of Global_Time. When the TTCAN communication is initialized, the actual time master may adjust the phase of Global_Time by adding an offset (Global_Time_Preset, see Figure 5) to the transmitted Master_Ref_Mark value, e.g. to synchronize to an external clock. Any such intended discontinuity of Global_Time is signaled in the Reference Message, by setting the Disc_Bit. Reference Messages with a set Disc_Bit are not used for clock calibration. TTCAN has the option to synchronize the communication schedule to specific events in the time masters’ nodes. When the communication is to be synchronized, the cyclic message transfer is discontinued after the end of a basic cycle and a time gap may appear between the end of that basic cycle and the beginning of the next, event synchronized basic cycle. The current time master announces the time gap by setting the Next_is_Gap bit in the Reference Message. The time gap ends as soon as the current time master or one of the potential time masters sends a Reference Message to start the following basic cycle of the matrix cycle. The transmission of the Reference Message will be triggered by the occurrence of a specific event or after a maximum waiting time. This block is a state machine that maintains the message schedule inside a basic cycle. The TSO gets its view of the message schedule from an array of time triggers in the trigger memory. Each time trigger has a time mark that defines at which Cycle_Time the trigger becomes active. A Tx_Trigger specifies when a specific message shall be transmitted. An Rx_Trigger specifies when the reception of a specific message shall be checked. A Tx_Ref_Trigger (_Gap) triggers the transmission of a Reference Message; it finishes the current basic cycle and starts a new cycle. Ref_Triggers are used by potential time masters only. A Watch_Trigger (_Gap) has a Time_Mark with a higher value than the Tx_Ref_Trigger (_Gap) and checks if the time since the last valid Reference Message has been too long. When in the last Reference Message the Next_is_Gap bit was set, the TSO ignores Tx_Ref_Trigger and Watch_Trigger, it uses Tx_Ref_Trigger_Gapand Watch_Trigger_Gap instead. In all other cases, Tx_Ref_Trigger and Watch_Trigger are used, Tx_Ref_Trigger_Gap and Watch_Trigger_Gap are ignored. The maximum time allowed for a time gap is the difference Tx_Ref_Trigger_Gap - Tx_Ref_Trigger. Figure 7 shows an example how the host application of the time master can synchronize the TTCAN network’s Cycle_Time. First the host requests the time master to transmit a Reference Message with the Next_is_Gap bit set. The time gap starts when the basic cycle started by that reference Message is finished. The message schedule is restarted when the host triggers the next Reference Message. If the host fails to trigger the Reference Message within a specified time, the TSO itself triggers the Reference Message when its Cycle_Time reaches Tx_Ref_Trigger_Gap. When data are transmitted by TTCAN, no stations are addressed, but instead, the content of the message (e.g. rpm or engine temperature) is designated by an identifier that is unique throughout the network. The identifier defines not only the content but also the priority of the message. This is important for bus allocation when several stations are competing for bus access. A high degree of system and configuration flexibility is achieved as a result of the content-oriented addressing scheme. It is very easy to add stations to the existing CAN network without making any hardware or software modifications to the existing stations, provided that the new stations are purely receivers. Because the data transmission protocol does not require physical destination addresses for the individual components, it supports the concept of modular electronics and also permits multiple reception (broadcast, multicast) and the synchronization of distributed processes: measurements needed as information by several controllers can be transmitted via the network, in such a way that it is unnecessary for each controller to have its own sensor. occur with the CSMA/CD protocol, is not possible with CAN. Thus, CAN permits implementation of fast, traffic-dependent bus access which is non-destructive because of bitwise arbitration based on the message priority employed. In TTCAN level 1, there are two time bases, the Local_Time and the Cycle_Time. In level 2, there is additionally Global_Time. The host application has read access to all time bases; it can store the actual time value read at specific events, e.g. controlled by an interrupt service routine. A hardware implementation of TTCAN permits some features that are not possible in a software implementation, like bus-time-based interrupts, a stop-watch function, and the event trigger EVT. When EVT is high at the end of a basic cycle, a time gap is started. The Reference Message to end the time gap is triggered at the next falling edge of EVT (see Figure 8). If the falling edge does not occur within a specified time, the TSO itself triggers the Reference Message when its Cycle_Time reaches Tx_Ref_Trigger_Gap. No time gap is started when EVT is low at the end of a basic cycle; only falling edges that occur during a time gap can trigger a Reference Message. Local_Time, Cycle_Time, and Global_Time can	be compared to a time mark interrupt register. When the selected time value matches the register value, an interrupt is generated. This event may trigger the CPU’s interrupt line or may be directly connected to an output port. The TMI output(s) can be used to synchronize the application to the TTCAN’s Cycle_Time or Global_Time. TTCAN is based on a time triggered and periodic communication which is clocked by a time master’s reference message. The reference message can be easily recognized by its identifier. Within TTCAN’s level 1 the reference message only holds some control information of one byte, the rest of a CAN message can be used for data transfer. In extension level 2, the reference message holds additional control information, e.g. the global time information of the current TTCAN time master. The reference message of level 2 covers 4 bytes while downwards compatibility is guaranteed. The remaining 4 bytes are open for data communication as well. Practice has shown that applications include many control loops and tasks with different periods. They all need individual sending patterns for their information. The TTCAN basic cycle would not offer enough flexibility to satisfy this need. The TTCAN specification allows using more than one basic cycle to build the communication matrix or system matrix of the systems engineer’s needs. Several basic cycles are connected to build the matrix cycle. Most patterns are possible, e.g. sending every basic cycle, sending every second basic cycle, or sending only once within the whole system matrix.TTCAN specification allows also another useful exception. The system matrix is highly column oriented. It may make sense to ignore the columns in the case of two or more arbitrating time windows in series. The most important constraint for this construct is that the starting point of a spontaneous message within this merged arbitrating window is not allowed if it will not fit in the remaining time window. The start of the next periodic time window must be guaranteed. This is the task of an off-line design tool used to build TTCAN system matrices. The automatic retransmission within a merged arbitrating time window is allowed as long as the constraint already described above is satisfied. TTCAN is based on the most successful automotive control network to date. It appends a set of new features to the existing CAN protocol through the introduction of a session layer protocol onto the CAN protocol stack. The original CAN protocol may exhibit performance limitations in certain hard real-time applications. The time-triggered solution provided by TTCAN offers improved reliability, determinism, and synchronization quality for current and future hard real-time distributed applications. Many semiconductor manufacturers have recognized the benefits and potential market for TTCAN, and are currently working on their TTCAN compliant devices. TTCAN promises to offer design engineers a new robust solution to hard real-time distributed applications. read more "TTCAN - Time Triggered Controller Area Network"
The Tiger SHARC processor is the newest and most power member of this family which incorporates many mechanisms like SIMD, VLIW and short vector memory access in a single processor. This is the first time that all these have been combined in a real time processor. The TigerSHARC DSP is an ultra high performance static superscalar architecture that optimized for tele-communications infrastructure and other computationally demanding applications. The unique architecture combines elements of RISC, VLIW and standard DSP processors to provide native support for 8, 16,and 32-bit fixed, as well as floating point data types on single chip. Large on-chip memory, extremely high internal and external bandwidths and dual compute blocks provide the necessary capabilities to handle a vast array of computationally demanding, large signal processing tasks. In many cases, the signal of interest is initially in the form of an analog electrical voltage or current, produced for example by a microphone or some other type of transducer. An analog signal must be converted into digital form before DSP techniques can be applied. An analog electrical voltage signal, for example, can be digitized using an electronic circuit called an analog-to-digital converter or ADC. This generates a digital output as a stream of binary numbers whose values represent the electrical voltage input to the device at each sampling instant. Signals commonly need to be processed in a variety of ways. For example, the output signal from a transducer may well be contaminated with unwanted electrical "noise". The electrodes attached to a patient's chest when an ECG is taken measure tiny electrical voltage changes due to the activity of the heart and other muscles. The signal is often strongly affected by "mains pickup" due to electrical interference from the mains supply. Processing the signal using a filter circuit can remove or at least reduce the unwanted part of the signal. Increasingly nowadays, the filtering of signals to improve signal quality or to extract important information is done by DSP techniques rather than by analog electronics. (such as Texas Instruments, Analog Devices and Motorola) to develop Digital Signal Processor chips - specialised microprocessors with architectures designed specifically for the types of operations required in digital signal processing. (Note that the acronym DSP can variously mean Digital Signal Processing, the term used for a wide range of techniques for processing signals digitally, or Digital Signal Processor, a specialised type of microprocessor chip). Like a general-purpose microprocessor, a DSP is a programmable device, with its own native instruction code. DSP chips are capable of carrying out millions of floating point operations per second, and like their better-known general-purpose cousins, faster and more powerful versions are continually being introduced. DSPs can also be embedded within complex "system-on-chip" devices, often containing both analog and digital circuitry. One of the biggest bottlenecks in executing DSP algorithms is transferring information to and from memory. This includes data, such as samples from the input signal and the filter coefficients, as well as program instructions, the binary codes that go into the program sequencer. For example, suppose we need to multiply two numbers that reside somewhere in memory. To do this, we must fetch three binary values from memory, the numbers to be multiplied, plus the program instruction describing what to do. Figure 1(a).shows how this seemingly simple task is done in a traditional microprocessor. This is often called a Von Neumann architecture, after the brilliant American mathematician John Von Neumann (1903-1957). Von Neumann guided the mathematics of many important discoveries of the early twentieth century. His many achievements include: developing the concept of a stored program computer, formalizing the mathematics of quantum mechanics, and work on the atomic bomb. design. When an instruction is processed in such a processor, units of the processor not involved at each instruction phase wait idly until control is passed on to them. Increase in processor speed is achieved by making the individual units operate faster, but there is a limit on how fast they can be made to operate. So we need other architectures when very fast processing is required, and we are willing to pay the price of increased complexity. This leads us to the Harvard architecture, shown in (b). This is named for the work done at Harvard University in the 1940s under the leadership of Howard Aiken (1900-1973). As shown in this illustration, Aiken insisted on separate memories for data and program instructions, with separate buses for each. Since the buses operate independently, program instructions and data can be fetched at the same time, improving the speed over the single bus design. Most present day DSPs use this dual bus architecture. Figure (c) illustrates the next level of sophistication, the Super Harvard Architecture. This term was coined by Analog Devices to describe the internal operation of their ADSP-2106x and new ADSP-211xx families of Digital Signal Processors. These are called SHARC® DSPs, a contraction of the longer term, Super Harvard ARChitecture. The idea is to build upon the Harvard architecture by adding features to improve the throughput. While the SHARC DSPs are optimized in dozens of ways, two areas are important enough to be included in Fig. (c): an instruction cache, and an I/O controller. A handicap of the basic Harvard design is that the data memory bus is busier than the program memory bus. When two numbers are multiplied, two binary values (the numbers) must be passed over the data memory bus, while only one binary value (the program instruction) is passed over the program memory bus. To improve upon this situation, we start by relocating part of the "data" to program memory. For instance, we might place the filter coefficients in program memory, while keeping the input signal in data memory. (This relocated data is called "secondary data" in the illustration). At first glance, this doesn't seem to help the situation; now we must transfer one value over the data memory bus (the input signal sample), but two values over the program memory bus (the program instruction and the coefficient). In fact, if we were executing random instructions, this situation would be no better at all. However, DSP algorithms generally spend most of their execution time in loops. This means that the same set of program instructions will continually pass from program memory to the CPU. The Super Harvard architecture takes advantage of this situation by including an instruction cache in the CPU. This is a small memory that contains about 32 of the most recent program instructions. The first time through a loop, the program instructions must be passed over the program memory bus. This results in slower operation because of the conflict with the coefficients that must also be fetched along this path. However, on additional executions of the loop, the program instructions can be pulled from the instruction cache. This means that all of the memory to CPU information transfers can be accomplished in a single cycle: the sample from the input signal comes over the data memory bus, the coefficient comes over the program memory bus, and the program instruction comes from the instruction cache. In the jargon of the field, this efficient transfer of data is called a high memory-access bandwidth. Just as important, dedicated hardware allows these data streams to be transferred directly into memory (Direct Memory Access, or DMA), without having to pass through the CPU's registers. The main buses (program memory bus and data memory bus) are also accessible from outside the chip, providing an additional interface to off-chip memory and peripherals. This allows the SHARC DSPs to use a four Gigaword (16 Gbyte) memory, accessible at 40 Mwords/second (160 Mbytes/second), for 32 bit data. This type of high speed I/O is a key characteristic of DSPs. The overriding goal is to move the data in, perform the math, and move the data out before the next sample is available. Everything else is secondary. Some DSPs have on-board analog-to-digital and digital-to-analog converters, a feature called mixed signal. However, all DSPs can interface with external converters through serial or parallel ports. At the top of the diagram are two blocks labeled Data Address Generator (DAG), one for each of the two memories. These control the addresses sent to the program and data memories, specifying where the information is to be read from or written to. In simpler microprocessors this task is handled as an inherent part of the program sequencer, and is quite transparent to the programmer. However, DSPs are designed to operate with circular buffers, and benefit from the extra hardware to manage them efficiently. This avoids needing to use precious CPU clock cycles to keep track of how the data are stored. For instance, in the SHARC DSPs, each of the two DAGs can control eight circular buffers. This means that each DAG holds 32 variables (4 per buffer), plus the required logic. Some DSP algorithms are best carried out in stages. For instance, IIR filters are more stable if implemented as a cascade of biquads (a stage containing two poles and up to two zeros). Multiple stages require multiple circular buffers for the fastest operation. The DAGs in the SHARC DSPs are also designed to efficiently carry out the Fast Fourier transform. In this mode, the DAGs are configured to generate bit-reversed addresses into the circular buffers, a necessary part of the FFT algorithm. In addition, an abundance of circular buffers greatly simplifies DSP code generation- both for the human programmer as well as high-level language compilers, such as C.
The data register section of the CPU is used in the same way as in traditional microprocessors. In the ADSP-2106x SHARC DSPs, there are 16 general purpose registers of 40 bits each. These can hold intermediate calculations, prepare data for the math processor, serve as a buffer for data transfer, hold flags for program control, and so on. If needed, these registers can also be used to control loops and counters; however, the SHARC DSPs have extra hardware registers to carry out many of these functions. The math processing is broken into three sections, a multiplier, an arithmetic logic unit (ALU), and a barrel shifter. The multiplier takes the values from two registers, multiplies them, and places the result into another register. The ALU performs addition, subtraction, absolute value, logical operations (AND, OR, XOR, NOT), conversion between fixed and floating point formats, and similar functions. Elementary binary operations are carried out by the barrel shifter, such as shifting, rotating, extracting and depositing segments, and so on. A powerful feature of the SHARC family is that the multiplier and the ALU can be accessed in parallel. In a single clock cycle, data from registers 0-7 can be passed to the multiplier, data from registers 8-15 can be passed to the ALU, and the two results returned to any of the 16 registers. There are also many important features of the SHARC family architecture that aren't shown in this simplified illustration. For instance, an 80 bit accumulator is built into the multiplier to reduce the round-off error associated with multiple fixed-point math operations. Another interesting feature is the use of shadow registers for all the CPU's key registers. These are duplicate registers that can be switched with their counterparts in a single clock cycle. They are used for fast context switching, the ability to handle interrupts quickly. When an interrupt occurs in traditional microprocessors, all the internal data must be saved before the interrupt can be handled. This usually involves pushing all of the occupied registers onto the stack, one at a time. In comparison, an interrupt in the SHARC family is handled by moving the internal data into the shadow registers in a single clock cycle. When the interrupt routine is completed, the registers are just as quickly restored. This feature allows step 4 on our list (managing the sample-ready interrupt) to be handled very quickly and efficiently. SHARC has 32/42 bit floating and fixed point core.DMA controller and duel ported SRAM to move data into and out of memory without wasting core cycles. It has high performance computation unit. It has four bus performances. They include fetch next instruction, access 2 data values, performs DMA for I/O device. Tiger sharc processors provide the highest performance density for multiplexing applications with peak performance and well above a billion floating point operations per second. One Gbyte/sec multiprocessing link ports gluelessly multiple Tiger sharc processors, and versions are available with up to 24 Mbits of integrated, on chip memory. Keeping pace with the accelerating march of architectural innovation in DSPs, Analog devices (ADI) unveiled its third generation floating point DSP,TIGERSHARC. There architect Jose Fridman described a complex, high performance VLIW-based design incorporating unusually extensive single-instruction, multiple data (SIMD) capabilities. Unlike its predecessors, which are primarily aimed at application demanding floating point arithmetic, TigerSHARc has excellent fixed point capabilities and is better described as 16-bit fixed point DSP with floating point support than as a floating point DSP. The TigerSHARC® Processor provides leading-edge system performance while keeping the highest possible flexibility in software and hardware development. 500 MHz, 2.0 ns instruction cycle rate. Single precision IEEE 32-bit and extended bit precision 40-bit floating point data formats and 8-,16-,32- and 64 bit fixed point data formats. Integrated I/O include 14 channel DMA controller, external port,progamable flag pins, two timers and timer expired pin for system integration. TigerSHARC processor is an ultrahigh performance, static superscalar processor optimized for large signal processing tasks and communication infrastructure. The DSP combines very memory widths with dual computation blocks-supporting floating point (IEEE 32-bit and extended precision 40-bit) and fixed point (8-,16-,32-,64- bits) processing to set a new standard of performance for digital signal processors. The TigerSHARC static superscalar architecture lets the DSP execute up to four instructions each cycle, performing 24 fixed point (16-bit) operations. Four independent 128-bit wide internal data buses, each connecting to the six 2M bit memory banks, enable quad –word data, instruction, and I/O address and provide 28 Gbytes per second of internal memory bandwidth. Like its competititor Texas Instruments’ TMC320C64x, TigerSHARC uses a very long instruction word (VLIW) load/store architecture.TigerSHARC executes as any as four instructions per cycle with its interlocking ten-stage pipeline and dual computation blocks. Each block contains a multiplier, an ALU, and a 64 –bit shifter and can perform one 32-*32 bit or four 16-*16-bit multiply –accumulates (MAC) per cycle. TigerSHARC is aimed at telecommunications infrastructure applications, such as cellular telephone base stations. As illustrated in fig. the TigerSHARC architecture contains a program control unit two computation units, two address generators memory various peripherals and a DMA controller. With its VLIW architecture TigerSHARC is capable of executing up to four instructions in a single cycle, and its SIMD features enable it to perform arithmetic operations on multiple 32-bit floating point values or multiple 32-,16- or 8-bit fixed point values. Each of TigerSHARC’s computation units can perform two 32*32=64-bit fixed point multiply-accumulates in a single cycle, using two operands each made up of two concatenated 32-bit registers. Thus using both computation units TigerSHARc can perform four 32*32=64-bit fixed –point multiply-accumulate operations in a single cycle. Alternatively, TigerSHARC can perform two 32-bit floating point MAC operations per cycle. In fixed point DSP applications, the most common word width is 16-bits.With four 16-bit fixed point elements concatenated in two 32-bit registers, one computation unit can in a single cycle perform four 16*16=32-bit multiply-accumulate operations (with 8 guard bits each to avoid overflow)-twice as many as any currently available fixed or floating point DSP can perform. TigerSHARC uses SIMD features at two levels-two separate computation units that each operate on SIMD operands .Fig illustrates how the two SIMD computation units divide the registers into different data sizes. TigerSHARC is the first of the new wave of VLIW –based DSPs to provide extensive SIMD capabilities. This approach provides greater parallelism than that of its Texas Instruments competitors. On-chip memory is divided into three banks: one for soft-ware and two for data. ADI will not disclose the amount of on-chip memory in the first TigerSHARC devices, but we expect that the vendor will continue to be generous with on-chip memory; the predecessor SHARC and Hammerhead devices include 68K to 512K of on-chip memory. When moving 64-bit or 128-bit data, TigerSHARC transfers data from consecutive memory locations to consecutive data registers, or vice versa. The smallest amount of data that can be transferred is 32 bits. If TigerSHARC programs use word sizes of 8 or 16 bits in a DSP algorithm, they cannot access individual words; any load or store will transfer at least four 8-bit or two 16-bit words. The chip includes a data alignment buffer and a short data alignment buffer that allow 64 or 128 bits of data to be transferred from (but not to) any memory location aligned on a 16-bit word boundary. TigerSHARC provides more flexibility than most processors with SIMD features, which often require that data be aligned at memory locations divisible by the size of the data transfer. Data is transferred between the computation units and on-chip memory in blocks of 32-,64-,or128-bits.When moving 64-bit or 128-bit data,TigerSHARC transfers data from consecutive memory locations to consecutive data registers, or vice versa. The smallest amount of data that can be transferred is 32-bits.If TigerSHARC programs use word size of 8 or 16 bits in a DSP algorithm ,they cannot access individual words, any load or store will transfer at least four 8-bit or two 16-bit words. The chip includes a data alignment buffer and a short data alignment buffer that allow 64 or 128 bits of data to be transferred from (but not to be) any memory location aligned on a 16-bit word boundary.TigerSHARC provides more flexibility than most processors with SIMD features, which often require that data be aligned at memory locations divisible by the size of the data transfer. The TigerSHARC's unique ability to process 1-, 8-, 16- and 32-bit fixed-point as well as floating-point data types on a single chip allows original equipment manufacturers to adapt to evolving telecommunications standards without encountering the limitations of traditional hardware approaches .Having the highest performance DSP for communications infrastructure and multiprocessing applications available, TigerSHARC allows wireless infrastructure manufacturers to continue evolving their design to meet the needs of their target system, while deploying a highly optimized and effective Node B solution that will realize significant overall cost savings. This enables a multiprocessor network exclusively made up of TigerSHARCs without any expensive and power consuming external memories or logic. programming with dependency-free instructions can eliminate most computational and memory transfer dependencies. All of the instruction parallel rules and data dependencies are documented in the TigerSHARC Processor User's Guide. point multiplication as well as fixed-point multiply and accumulates. The 64-bit shifter performs logical and arithmetic shifts, bit and bit-stream manipulation, and field deposit and extraction. The TigerSHARC Processor IALUs enable implementation of circular buffers in hardware. Circular buffers facilitate efficient programming of delay lines and other data structures required in digital signal processing, and they are commonly used in digital filters and Fourier transforms. Each IALU provides registers for four circular buffers, so applications can set up a total of eight circular buffers. The IALUs handle address pointer wraparound automatically, reducing overhead, increasing performance, and simplifying implementation. Circular buffers can start and end at any memory location. Because the IALU's computational pipeline is one cycle deep, in most cases integer results are available in the next cycle. Hardware (register dependency check) causes a stall if a result is unavailable in a given cycle. The large on-chip memory is divided into three separate blocks of equal size. Each block is 128-bits wide, offering the quad word structure and four addresses for every row. For data accesses, the processor can address one 32-bit word or two 32-bit words (long) or four 32-bit words (quad) and transfer it to/from a single computational unit or to both in a single processor cycle. The user only has to care that the start addresses are either modulo two or modulo four addresses when fetching long words and quad words. In applications that require computing data of a delay line in which the start address of the variable does not match the modulo requirements, or in other applications that require unaligned data fetches a data alignment buffer (DAB) is provided. Once the DAB is filled, quad word fetches can be made from it.Besides the internal memory, the TigerSHARC can access up to four giga words of memory. At a 250 MHz clock rate, the ADSP-TS101S [TigerSHARC] offers a DSP industry-best 1500 MFLOPS peak performance and has native support for 8, 16, 32, and 40-bit data types. With a 1.5 watt typical power dissipation, 6 Mbits of on-chip memory, 14 channel zero-overhead DMA engine, integrated SDRAM controller, parallel host interface, cluster multiprocessing support, and link port multiprocessing support, the TigerSHARC is ideal for heat sensitive multiprocessing applications. Wireless Infrastructure - GSM, EDGE, and 3G cellular base stations." The Analog Devices TigerSHARC® Processor architecture provides the greatest marriage of performance and flexibility enabling the most cost effective solution for baseband processing and other applications within the Wireless Infrastructure market space today. Wireless Infrastructure manufacturers can consider many approaches when developing baseband modem solutions for third generation wireless communications networks (3G), however the TigerSHARC Processor architecture provides the balance of attributes required to satisfy the entire range of challenges facing their 3G deployments. The TigerSHARC Processor is the heart of a software defined solution for baseband modems where all of the implementation occurs in software rather than in hardware as is the approach taken by ASIC and other competing DSP solutions. The TigerSHARC Processor allows for the infrastructure vendor to establish a single baseband processing platform for all of the 3G standards with easily implemented software changes to update functionality and speed time to market. The very powerful architecture of the TigerSHARC, combining the best elements of RISC and DSP cores, is highly suited to deliver the performance required for upcoming applications in 3G mobile communications, xDSL technologies and imaging systems. The Static Superscalar architecture maintains determinism for security-sensitive applications and the high number of internal registers allows the efficient use of a high-level language, speeding up the development process of the designers. read more "Tiger SHARC Processor - Engineering Seminar"
The purpose of the 10 Gigabit Ethernet proposed standard is to extend the 802.3 protocols to an operating speed of 10 Gbps and to expand the Ethernet application space to include WAN links. This will provide for a significant increase in bandwidth while maintaining maximum compatibility with the installed base of 802.3 interfaces, previous investment in research and development, and principles of network operation and management. It must have broad market potential, supporting a broad set of applications, with multiple vendors supporting it, and multiple classes of customers. It must be compatible with other existing 802.3 protocol standards, as well as with both Open Systems Interconnection (OSI) and Simple Network Management Protocol (SNMP) management specifications. It must be substantially different from other 802.3 standards, making it a unique solution for a problem rather than an alternative solution. It must have demonstrated technical feasibility prior to final ratification. It must be economically feasible for customers to deploy, providing reasonable cost, including all installation and management costs, for the expected performance increase. An Ethernet PHYsical layer device (PHY), which corresponds to Layer 1 of the OSI model, connects the media (optical or copper) to the MAC layer, which corresponds to OSI Layer 2. Ethernet architecture further divides the PHY (Layer 1) into a Physical Media Dependent (PMD) and a Physical Coding Sublayer (PCS). Optical transceivers, for example, are PMDs. The PCS is made up of coding (e.g., 64/66b) and a serializer or multiplexing functions. Managers of enterprise and service provider networks have to make many choices when they design networks. They have multiple media, technologies, and interfaces to choose from to build campus and metro connections: Ethernet (100, 1000,and 10,000 Mbps), OC-12 (622 Mbps) and OC-48 (2.488 Gbps), SONET or equivalent SDH network, packet over SONET/SDH (POS), and the newly authorized IEEE 802 Task Force (802.17) titled Resilient Packet Ring. The next step for enterprise and service provider networks is the combination of multi-gigabit bandwidth with intelligent services, leading to scaled, intelligent, multi-gigabit networks with backbone and server connections ranging up to 10 Gbps. In response to market trends, Gigabit Ethernet is currently being deployed over tens of kilometers in private networks. With 10 Gigabit Ethernet, the industry has developed a way to not only increase the speed of Ethernet to 10 Gbps but also to extend its operating distance and interconnectivity. In the future, network managers will be able to use 10 Gigabit Ethernet as a cornerstone for network architectures that encompass LANs, MANs and WANs using Ethernet as the end-to-end, Layer 2 transport method. Ethernet technology is already the most deployed technology for high performance LAN environments. With the extension of 10 Gigabit Ethernet into the family of Ethernet technologies, the LAN now can reach farther and support up coming bandwidth hungry applications. Similar to Gigabit Ethernet technology, the 10 Gigabit proposed standard supports both singlemode and multi-mode fiber mediums. However in 10 Gigabit Ethernet, the distance for single-mode fiber has expanded from the 5km that Gigabit Ethernet supports to 40km in 10 Gigabit Ethernet. Additionally, 10 Gigabit Ethernet will provide infrastructure for both network-attached storage (NAS) and storage area networks (SAN). Prior to the introduction of 10 Gigabit Ethernet, some industry observers maintained that Ethernet lacked sufficient horsepower to get the job done. Ethernet, they said, just doesn’t have what it takes to move “dump truck loads worth of data.” 10 Gigabit Ethernet, can now offer equivalent or superior data carrying capacity at similar latencies to many other storage networking technologies including 1 or 2 Gigabit Fiber Channel, Ultra160 or 320 SCSI, ATM OC-3, OC-12 & OC-192,and HIPPI (High Performance Parallel Interface). While Gigabit Ethernet storage servers, tape libraries and compute servers are already available, users should look for early availability of 10 Gigabit Ethernet end-point devices in the second half of 2001. 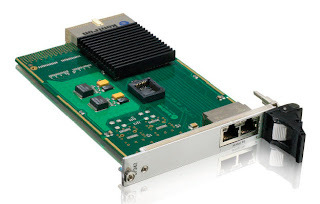 The XAUI is a low pin count, self-clocked serial bus that is directly evolved from the Gigabit Ethernet 1000BASE-X PHY. The XAUI interface speed is 2.5 times that of 1000BASE-X. By arranging four serial lanes, the 4-bit XAUI interface supports the ten-times data throughput required by 10 Gigabit Ethernet. The IEEE 802.3ae Task Force has developed a draft standard that provides a physical layer that supports link distances for fiber optic media as shown in Table A. To meet these distance objectives, four PMDs were selected. The task force selected a 1310 nanometer serial PMD to meet its 2km and 10km single-mode fiber (SMF) objectives. It also selected a 1550 nm serial solution to meet (or exceed) its 40km SMF objective. Support of the 40km PMD is an acknowledgement that Gigabit Ethernet is already being successfully deployed in metropolitan and private, long distance applications. An 850 nanometer PMD was specified to achieve a 65-meter objectiveover multimode fiber using serial 850 nm transceivers. Additionally, the task force selected two versions of the wide wave division multiplexing (WWDM) PMD, a 1310 nanometer version over single-mode fiber to travel a distance of 10km and a 1310 nanometer PMD to meet its 300-meter-over-installedmultimode- fiber objective. The LAN PHY and the WAN PHY will operate over common PMDs and, therefore, will support the same distances. These PHYs are distinguished solely by the Physical Encoding Sublayer (PCS). (See Figure 7.) The 10 Gigabit LAN PHY is intended to support existing Gigabit Ethernet applications at ten times the bandwidth with the most cost-effective solution. Over time, it is expected that the LAN PHY will be used in pure optical switching environments extending over all WAN distances. However, for compatibility with the existing WAN network, the 10 Gigabit Ethernet WAN PHY supports connections to existing and future installations of SONET/SDH (Synchronous Optical Network/ Synchronous Digital Hierarchy) circuit-switched telephony access equipment. The WAN PHY differs from the LAN PHY by including a simplified SONET/SDH framer in the WAN Interface Sublayer (WIS). Because the line rate of SONET OC-192/ SDH STM-64 is within a few percent of 10 Gbps, it is relatively simple to implement a MAC that can operate with a LAN PHY at 10 Gbps or with a WAN PHY payload rate of approximately 9.29 Gbps. (See Figure 9.). Appendix III provides a more in depth look at the WAN PHY. read more "10 Gigabit Ethernet Technology - Seminar paper"